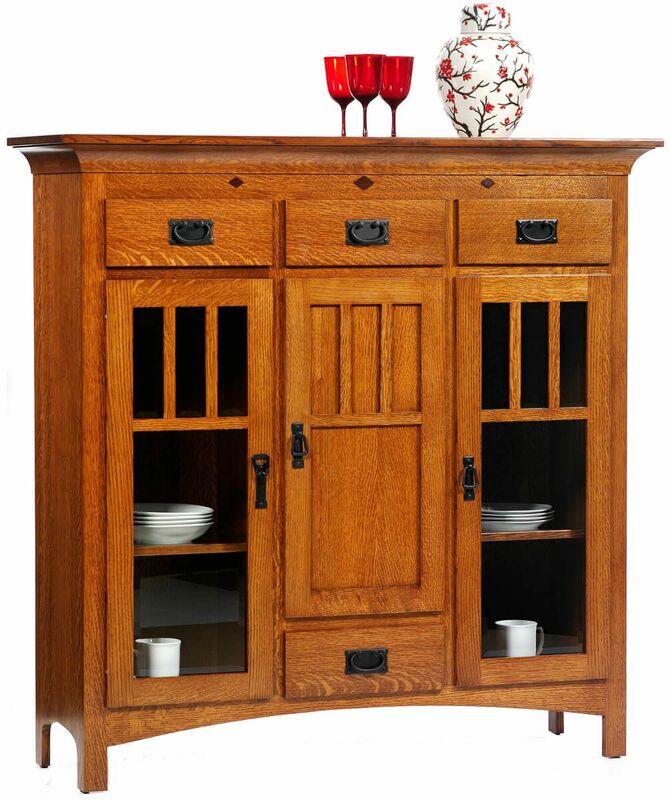 Less formal than a traditional china hutch, our Desert Hills Mission Dutch Pantry packs plenty of clever storage and and display into a compact design. With the finest solid woods, our expert Amish artisans will carefully create a Desert Hills Dutch Pantry to last you a lifetime. This Mission styled cabinet showcases beautiful beveled glass with mullion doors, plate grooved glass shelves with solid wood facing, and durable dovetailed drawers mounted on soft close, full extension slides for your convenience. With recessed lighting and a touch switch, you can show off your fine dinnerware in style. Use our online options menu to create a one of a kind Desert Hills Dutch Pantry. Shown in Quartersawn White Oak, your dining collection can also be built in Oak, Brown Maple, Rustic Cherry, Cherry, or Maple.